In excellent conditions, players in Brods’ usually well-organised defence were strangely hesitant and early tries were conceded to speculative kicks. The hard ground contributed to an uneven bounce and a mix-up led to third-placed Pontefract’s opener after just six minutes. The conversion was succesful. The Brods pack looked comfortable and earned a penalty on half way with a mighty heave to push the home side off their own ball. The goal attempt dropped short but the Woodhead boys were encouraged by this and continued to be competitive at scrum and line out. On 35 minutes the speedy Pontefract backs chased another speculative kick through and scored wide out on the left. An excellent conversion made it 14-0. Much of the game had been in midfield but on the cusp of half time a third converted try by the home side left Brods really up against it with a 21-0 deficit. Things got even worse when good interplay down the right led to Pontefract’s bonus point try and with a further score stretched the lead to 33-0. Brods were finally rewarded for possession and pressure on the Pontefract line with a fine Ben Hoyle try wide on the right. The conversion was missed but Brods continued to press, aided by a sequence of penalties. They were camped on the Pontefract line and a strong forward drive resulted in a second try for Hoyle, this time in the left hand corner. The visitors dominated for the last 10 minutes, attacking at every opportunity, and Ross Minney rounded off good handling down the right wing. Although a much-changed Brods side showed plenty of spirit they couldn’t make up for the early errors in defence. 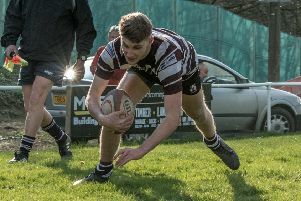 The sixth-placed side will look to get back to winning ways in their penultimate league game of the season at home to Old Rishworthians next Saturday.